Succulent plants, like all plants, have seasonal growth patterns. Plants in this category come from numerous genera, and have a wider variety of forms, textures, and colors, but they can be divided into just two principal growth patterns: Winter Dormant (“summer growers”) and Summer Dormant (“winter growers”) (see lists at the end of this page). It would be comforting to find that Winter Dormant succulents are native to the Northern Hemisphere and Summer Dormant plants are from the Southern Hemisphere, but it’s not that simple. It could be that growth patterns sometimes reflect a genus’s adaptation to its adopted environment. In any event, a succulent plant’s growth cycle affects its need for water and its bloom period. These plants require minimal watering during their dormant period and will produce blossoms during their growth period. If you have a large and varied collection of succulents, a good practice is to cluster separately the Winter Dormant and Summer Dormant plants, to simplify watering. Except for their blossom periods, many of which are delightful but rather brief, succulent plants are favored mostly for the shape, texture, and color of their foliage, which changes little through the seasons, except for size. Most popular plant genera have very specific annual cycles. Shows and sales of roses, irises, dahlias, tulips, daffodils, and amaryllis, for example, are very seasonal events. Succulent plant shows and sales, however, could occur at any time of the year. In contrast, California’s cactus & succulent societies hold their sales during the period from April through September. These sales offer the greatest variety and best prices, but gardeners can find at least the more common plants at their local garden center throughout the year. For local gardeners, important dates for cactus & succulent sales include the spring and fall events organized by the Monterey Bay Area Cactus & Succulent Society. These occur each year in late April and late September or (this year) early October. Another noteworthy occasion is the Succulent Extravaganza, presented with free admission by Succulent Gardens, a commercial entity. A highlight of this year’s event, on September 23 & 24, was Debra Lee Baldwin’s talk on “Bulletproof & Beautiful Succulents for your Garden.” Ms. Baldwin, called the Queen of Succulents, described a variety of attractive plants, emphasizing various forms of the genus Echeveria. I brought home an unusual and rare carunculated (warty) hybrid, Echeveria x Barbillion, which is shown by the accompanying photograph. During our brief conversation, Debra Less Baldwin and I exchanged stories about “midnight acquisitions” of succulent plants from both public and private gardens. I’ll write on that topic in another column. The next important opportunity for gardeners to build their succulent collections is the Fall Show & Sale of the Monterey Bay Area Cactus & Succulent Society. This event offers opportunities to talk with other gardeners who are enthusiastic about these plants and choose from an amazing array of small, inexpensive plants. There will also be a display of exceptional specimens, which you can vote on for a People’s Choice award, and a selection of unique containers that are right for artful presentation of succulent plants. The federal requirement to label foods with genetically engineered ingredients is generating turmoil in the marketplace. To review, a very large majority of U.S. consumers demanded labeling of GE foods, and the food industry spent a reported $400 million to defeat related legislation. The debate, which continued for over five years, resulted in late July of 2016 in the adoption of “compromise” legislation that strongly favored the food industry’s position. The central issue in the debate has been a policy of 1992 under which the U.S. Food & Drug Administration (FDA) concluded that the health and nutrient values of genetically engineered foods do not differ from “conventional” foods and therefore do not warrant labeling. Labeling advocates have insisted that GE foods have not been studied sufficiently by independent researchers, and federal policy ignores the environmental and economic impacts of such foods. Senator Dianne Feinstein (D-CA) supported labeling by pointing to consumers’ strong interest in knowing when foods contain GE ingredients. Consumer groups are still a bit stunned by the adoption of what has been called “the weakest labeling law imaginable.” They continue the struggle, but have abandoned the political arena and are moving future battles to the marketplace. The simplest strategy is buy only foods labeled as organic, under long-standing federal standards. Organic foods, by definition, do not contain GE ingredients. A related strategy includes rejecting foods labeled as “natural.” Some consumers regard “natural” and “organic” as equivalent but current FDA practice states that “natural” foods do not include artificial ingredients. The FDA is being pressured to define “natural” in a way that includes foods with GE ingredients. We’ll see how that goes! Another strategy is take legal action against companies that label foods as “organic” when they in fact contain GE ingredients. To date, such initiatives appear to be effective. One group has mounted a campaign to label selected conventional foods with the “Non-GMO Project Verified Butterfly.” Such labels are becoming more used, reportedly. One thoughtful observer, food writer Mark Bittman, has suggested that the GE labeling “cloud” has a silver lining, because the new labeling law opens the door to a new era of transparency about food products. He notes that the new law, however flawed, calls for labeling a food’s production process in addition to labeling its health and nutrient values. Bittman lists the new categories of information that consumers should be told about a food product’s ingredients: Where are they from? Were they dosed with pesticides or other synthetic chemicals? How much water was used to grow them? Did farm workers receive fair pay and treatment? Were farming practices friendly to the environment? For food products from animals: Were the animals treated with antibiotics? Were the animals treated humanely? People depend on natural systems. Natural systems change in ways that people benefit from and can influence. There are no permanent or impermeable boundaries that prevent matter from flowing between systems. Decisions affecting resources and natural systems are complex and involve many factors. These very basic ideas certainly are important in learning about the environment. These principles are an updated version of ideas that were expressed in the early 1800s by Alexander von Humboldt (1969–1859), who presented his views of how the forces of nature interact with one another and about the unity of nature. At the time, Humboldt’s ideas were the leading edge of leading scientists’ understanding of natural systems. He developed these ideas by traveling extensively through South America and Central America, closely observing nature, and, significantly, learning from the wise practices of native populations. Humboldt was one of the great polymaths of history. He was the earliest geobotanist, studying the geographic distribution of plants (also called phytogeography), but also made important contributions to meteorology, and geology. His greatest contributions are in the area called terrestrial physics, which deals with the dynamic interconnections that comprise natural systems. A new book by Andrea Wulf describes Humboldt’s momentous journey through life in impressive and readable detail: The Invention of Nature: Alexander von Humboldt’s New World (Knopf, 2016). The book is organized chronologically, in five parts. Humboldt shared his extensive knowledge and advanced ideas through extensive publications, correspondence, and public lectures. His major work was Cosmos. Sketch for a Physical Description of the Universe. This five-volume work, was widely read and highly regarded, and added to his reputation as the greatest scientists of his era. Humboldt conversed with many prominent people of his day and directly or indirectly influenced a long list of scientists, authors, and political leaders, too many to list here. Andrea Wulf, who has also written about other historically important botanists, has provided a masterful, readable, and valuable account of the “formidable genius” Alexander von Humboldt. The New York Times named The Invention of Nature as one of the best books of 2015 and several additional reviewers recognized its quality, This book presents the fascinating story of a man who explained the natural context in which gardening is done. A friend recently showed me an area that she wanted to landscape, and asked about a designer. I was able to recommend another friend (an accomplished designer) but the project motivated me to review the “design & install” category of landscaping projects. First, consider how you will use the landscaped area. Too many spaces are created for certain purposes and then little used because the homeowner doesn’t really enjoy outdoor entertaining, the kids have grown and flown, the design requires too much maintenance, etc. Then, learn all you can about the area to be developed. Make at least a rough scale drawing of the area. Mark important plants or other features that are to be retained. Indicate significant microclimates, e.g., deep shade, windy areas, water-retaining swales. Diagram that seasonal path of the sun. Have the soil tested. Bring in a designer, unless you are confident in your own ideas and plant selections. These days, it’s good to find someone who understands and practices soil regeneration, integrated pest management, and organic practices in general. The Green Gardener program lists landscapers with up-to-date training. Contractors with long years of experience might be skilled in—and committed to—outdated methods. Begin the install process with any required grading and the hardscape elements, e.g., paths, retaining walls, ponds, garden structures. Here are Missy Henriksen’s tips, with my running commentary. Communicate your long-term vision for your lawn. Well, lawns are on their way out, because to look really good they need a lot of mowing and edging, and synthetic chemicals. Otherwise, the advice is to be clear about longer-term visions, so that the contractor can provide a phased plan. Understand the importance of working with native flowers, shrubs, and trees. Plants that are native to your specific area will thrive in your garden, while exotic imports will require extraordinary efforts to keep them alive and growing, and might still struggle. Consider what time investment you want to make in your landscape after the installation is done. The late gardener and garden writer, Christopher Lloyd, favored high-maintenance gardening, which could entail changing plants frequently to provide year-round color. That practice has made his garden, Great Dixter, famous, but it’s not every gardener’s priority. Allow adequate time for your landscape project. Certainly, the client should accept the reality that everything takes longer than expected, but it’s also reasonable to expect your contractor to make steady progress on your project, and not compromise that progress to work on someone else’s priority. Know your budget. Address financial constraints by a phased approach to your longer-term objectives. A little self-discipline can be frustrating but better eventually than wishful thinking. On the other hand, the best results can result from thinking big. Ask any lingering questions. A good practice is to require a written contract that covers all significant issues. For larger landscaping projects, refer to “A Consumer Guide to Home Improvement Contracts” and “Choosing the Right Landscaper,” both publications of the California’s Contractors State License Board. Accept the contracted work only after satisfaction of applicable standards of the landscaping industry, rather than approval by the local government or a homeowner’s association. A successful landscaping project can give the garden owner long-term satisfaction and yield a substantial boost to the value of the property. Your local garden center has a continuing interest in what its customers seek and will seek in the future. That information has much to do with the success of the business, another factor that can affect the growth and success of your business is using a enterprise investment scheme for your finance. One important source of trends among gardening customers is the National Gardening Survey, a private company that conducts annual surveys of consumers of garden-related products. The NGS has recently released its 2015 survey. The full survey is quite pricey, but in today’s column we summarize the available highlights with an emphasis on the gardening customer’s perspective. The bottom line of the survey findings has been summed up as “a bold, exciting future for garden retail! !” That’s good news for your local garden center because it reflects growing interest among gardeners. The NGS estimates that 75% of all U.S. households are undertaking some level of gardening. That works out to 90 million households, an increase of six million households over 2014. So, gardening customers got a little younger, on average. The average annual expenditure on gardening rose from $317 to $401 per household, a stunning 26% increase year–to–year, and about 10% over the average of the previous five years. This combination of more customers and more spending makes the lawn and garden industry optimistic. The overall receipts of this industry total $36 billion, which is notably about three times the Hollywood box office receipts. Still, household spending for gardening products and services, when adjusted for inflation, remains well below the peak reached in 2003. The NGS’s findings don’t reveal why the rate of spending for garden items lags below the historical peaks, but one plausible interpretation is that gardeners are getting smarter by using online information. The NGS has concluded that garden customers are discovering the information they want through online research and then seeking validation at their local garden centers. This pattern contrasts with past practices in which customers asked garden center staff for basic information. The NGS recommends that garden center should focus more as project success centers, rather than hand-holding discovery centers. As your local garden center modifies its services in this way, you must find answers to your gardening questions on your own, using online resources, books and magazines, and fellow gardeners. Local garden societies can be important sources of basic gardening information. The staff at your local garden center surely will continue to respond to your factual questions, but the Internet will be more readily available and will offer a deeper trove of information. A great many tomatoes are available to home gardeners, either as seeds or seedlings. We are already well into the growing season, so if you enjoy growing tomatoes you are probably already past the stages of selecting a variety or planting seeds or seedlings. If you are already skilled at pruning your tomato plants, and doing the job in a timely manner, you will not need to read this column. For the rest of us, let us review the pruning process, with an emphasis on corralling a runaway tomato vine. The first bit of knowledge about growing tomatoes is that the multitude of cultivars includes just two types: determinate and indeterminate. The determinate plants develop a number of stems, leaves, and flowers, as predetermined by their genetics, and then stop growing. The fruits (actually berries according to the experts) all ripen at the same time, relatively early in the growing season. Pruning of these plants only reduces the harvest. The indeterminate plants continue to grow and produce stems, leaves, and fruits throughout the season. These are the plants that need controlling. 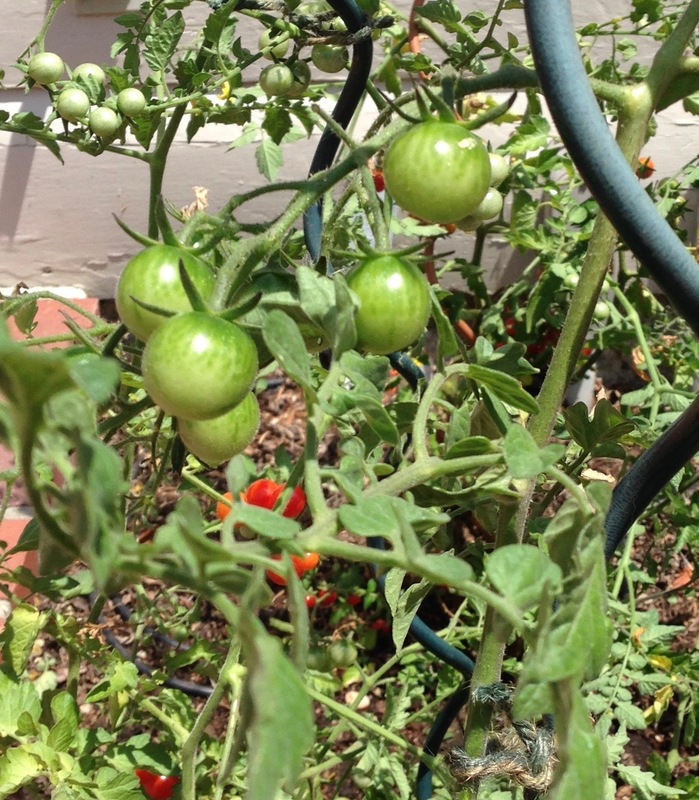 I am growing three tomato plants this year, all of which are the variety, Super Sweet 100, a popular bite-size tomato. I grew one of these plants last year, watched it produce a bounty of very tasty little tomatoes, and develop into the tangle that Frank F. warned about. Long after I had cleared the bed, a new spring arrived and several seedlings of Super Sweet 100 appeared. I replanted three of the best, determined to control the plant better. The goals of pruning a tomato plant are to promote larger fruits (not really an issue for cherry tomatoes), keep the plants tidy, and keep the plants off the ground to minimize the potential for disease. The Super Sweet 100 is a disease-resistant variety, but keeping the plant tidy and off the ground still seems worth the effort. The basic pruning technique is to remove side shoots, called suckers, that grow in the crotch (axil) between the main stem and the side stems. These suckers can produce fruits, but they tend to develop later than the primary fruit-bearing stems and reduce the plant’s vigor. Tomato plants grow rather quickly, so the removal of suckers is a weekly task. When the suckers are very young, they can be snapped off without the use of tools. Despite my nest intentions, my plants were soon well on their way to the predicted tangle. This condition inspired an experiment, which took the form of brutally cutting back branches that were sprawling in all directions and in several instances producing little or no fruit. More systematic training surely would have been better, but this approach was really the only option at the time. I expect and hope the plants will shrug off my abandonment of best practices and produce another bountiful harvest of sweet, small fruits. Those fruits are mostly green, still, but have plenty of time to ripen. I’ll try again next year to prune by the book. 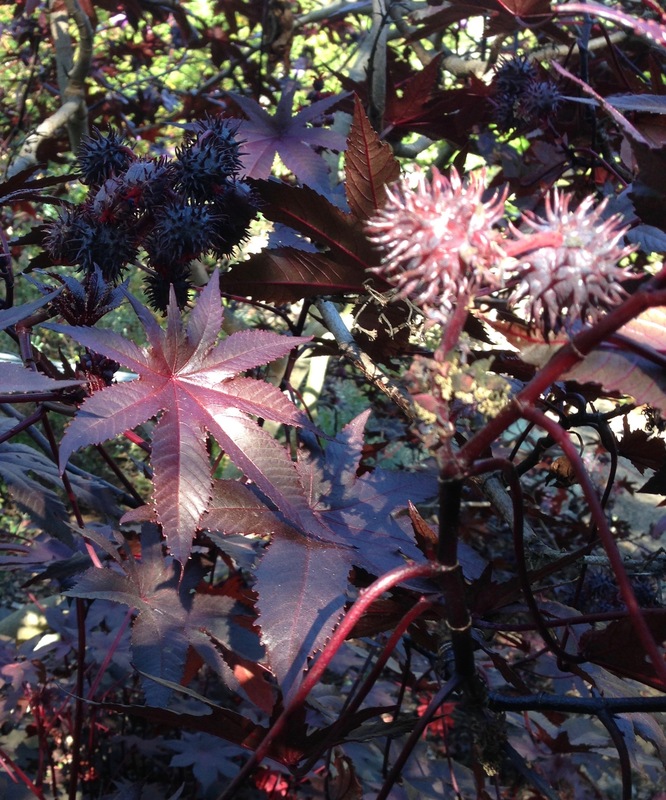 One such plant is the castorbean (Ricinus communis), also known as the castor oil plant. This is a member of the spurge family (Euphorbiaceae), native to the southeastern Mediterranean Basin, Eastern Africa, and India. It grows as a large shrub that can attain a height exceeding thirty feet. The popular garden varieties, however, grow to ten feet or less. The plant has several positive qualities, foremost being the striking appearance of its leaves, which are palm-shaped (palmate) and dark reddish-purple in color, becoming green with age. The shrub grows fairly quickly, and the gardener can control its shape with regular pruning. Also, being native to a Mediterranean climate, the castorbean, once established, is drought tolerant in the Monterey Bay area. Another positive quality is the plant’s usefulness for medicinal, insecticidal, and industrial purposes. There are several medicinal uses, including as a laxative. The greatest commercial value of the beans (actually seeds) is for motor lubrication. These applications do not, however, contribute to its value in the garden. The negative qualities must be acknowledged. First, the raw seeds are extremely toxic when chewed. They have been described as the most poisonous in the world. The seeds can be attractive and tasty-looking, but as few as four-to-eight seeds can be fatal to an adult. If you have this plant in your garden, you should ensure that neither children nor pets have opportunities to sample the seeds. The plant is also strongly allergenic. Its pollen can trigger asthmatic attacks, and its sap can cause skin rashes. Another negative quality is the castorbean’s tendency to propagate itself by dropping seeds. My plant has generated several crops of seedlings within a circle about thirty feet in diameter, centered on the mother plant. How the seeds plant themselves well beyond the plant’s drip line remains a mystery. The seedlings grow quickly up to three feet in height, but are easily uprooted. They do not transplant well, so I have not potted them for other gardeners. They might have inspired mixed reactions, especially by gardeners with children or pets. Despite its toxicity and allergenic potential, the castorbean is grown for its ornamental value throughout the world in compatible climates. This reality demonstrates the appreciation of avid gardeners for plants that bring unique contributions to the landscape. For at least some gardeners, the castorbean’s reddish-purple leaves are more important than the effort involved in protecting against the plant’s poisons and eradicating its unwanted progeny. Each gardener must make such decisions for his or her own garden. A popular activity whenever gardeners get together is for someone to give a talk. This links the speaker’s desire to share what he or she knows about gardening and the listener’s thirst for learning something—anything—about the enduring mysteries of horticulture. When a speaker addresses the methods, techniques, or practices of an aspect of gardening, the presentation amounts to teaching. When teaching equals performance in the front of the room, good teaching (according to some studies) requires the teacher to have knowledge of the subject, have a positive attitude toward the subject, and to be prepared. The same basic criteria apply to talks about gardening. Being prepared, in particular, means having specific goals for the talk, organizing the information for clarity, and providing a level of detail that is right for the audience. The Internet contains more ideas for effective public speaking. Many recommendations are about the style of presentation, e.g., incorporating humor, adding personal anecdotes, pausing occasionally for dramatic effect, etc. With many familiar recommendations like those listed here, we might expect generally successful talks about gardening, but really good presentations are actually exceptional. A recent presentation for the Monterey Bay Area Cactus & Succulent Society exemplified a good talk on gardening. The speaker was Gunnar Eisel, a long-time college professor of music theory and history, a long-time collector of cactus & succulent plants, and general manager of the Cactus & Succulent Society of America. His experience in public speaking was made evident when he appeared fully equipped with his own computer, digital projector and a sound system of very good quality. Clearly, he had one too many encounters with inadequate technology provided by his hosts. Gunnar Eisel titled his talk, “From Windowsill to the Poor House: Building and Maintaining a Cactus and Succulent Garden.” He organized his information in sections: Why Collect? ; Kinds of Collections; Sources of Plants; Right-sizing Your Collection; Visual Tours of Selected Collections; and Culture Recommendations. His presentation reflected his deep knowledge of and enthusiasm for his subject, and maintained the rapt attention of his audience for about one hour with good pacing, well-selected images and short video clips, and friendly humor. Not every garden group is prepared to bring in outstanding speakers, but expert gardeners who share their expertise with others can refine their presentation skills. When projecting the development of genetically engineered foods, we first acknowledge that no one really knows what we might find on grocery shelves in the future. It does seem likely, however, that consumers will not be given much information about their food products. Last week, the U.S. Senate, by a vote of 63-30, passed a bill to establish a uniform national standard for labeling foods with genetically engineered ingredients. Everyone supports a national standard for food labels. There’s nothing good about having each state require unique labels. This legislation, however, provides a deeply flawed national standard for labels. It does not penalize non-compliance, making it essentially voluntary. It does not require simple, on-package labels, but allows the use of QR codes that can only be read with a smartphone. It defines GE foods in a way that exempts a great many foods, as the U.S. Food & Drug Administration noted. The primary effect of the bill, then, is to preempt related state regulation in favor of this federal non-response to widespread consumer interest in knowing about their food. The Senate bill now goes to the U.S. House of Representatives, which had already passed similar legislation and very likely will support the Senate’s version. The margin of approval appears to be enough to override a presidential veto. What will GE technology produce in the future? We have already heard of so-called Arctic Apples that don’t turn brown as they age, crops that have chemical pesticides added internally, and several crops that are resistant to synthetic chemical weed killers. Each new food requires federal approval before it can be marketed, but approval is based on the producer’s own testing. Recent advances in genetic engineering technology called CRISPR can be used to modify organisms by editing existing genes. This technology has enabled faster and cheaper tinkering with both flora and fauna: reportedly, a high school student with a little training and inexpensive lab resources could edit genes. The products of gene editing do not involve the addition of foreign DNA and therefore do not require federal approval. Apparently, gene-edited foods also will not require labeling to indicate how they differ from natural foods. The competitive marketplace will be the principal control over our food supplies. That could lead to interesting and valuable results. When novel products become popular (and some probably will), their prices will rise. There have been claims that labeling GE foods as such would increase prices, but those claims were never shown to be accurate. Federal regulations already control which foods can be labeled as organic, and do not allow GE foods to be identified as organic. It remains to be seen whether foods with edited genes could be identified as organic. For now, consumers who are wary of foods that have been engineered, one way or another, should buy only foods that are labeled as organic.